Before Luke tells us about Mary’s Annunciation, he first tells us about the sanctification of John the Baptist in his mother’s womb (see Luke 1:15, “He will be filled with the Holy Spirit even from his mother’s womb”). So John the Baptist was sanctified before birth in Elizabeth’s womb (see CCC 717). If God prepared John the Baptist for his mission in such an extraordinary way, what are we to make of Mary of Nazareth who was chosen by God to be the mother of a Divine son? Well, the first point to consider is the manner in which the angel Gabriel greets Mary. According to the ICSB, “this is the only biblical instance where an angel addresses someone by a title instead of a personal name.” The angel, God’s special messenger, greets Mary with an extraordinarily descriptive title, saying, “HAIL, FULL OF GRACE” (Luke 1: 28). This descriptive title tells us something very important about Mary, to wit: she is full of grace! Naturally, the angel is to be believed! But it goes much deeper than this. Mary is Immaculate because she is full of grace, and this description of her is part of her deepest identity, which was made known by an angel sent by God Almighty, and revealed to us in the Gospel of Luke. Reference: As you can see, I am relying entirely on the Ignatius Catholic Study Bible. 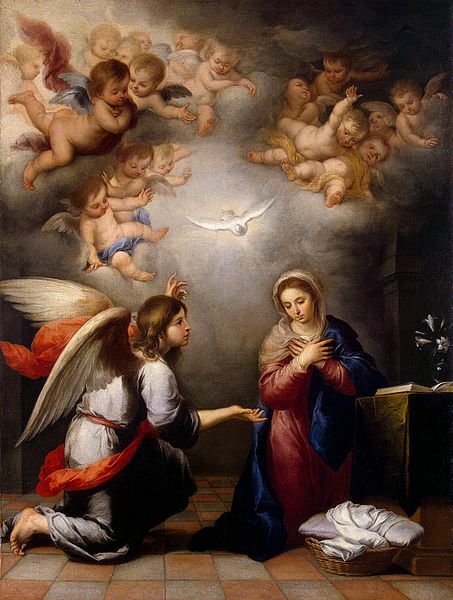 Image: The Annunciation by Bartolome Esteban Murillo, around 1665, Public Domain, U.S.A.